on Fat Tuesday, February 9, 2016. Celebrating the 67th Gay Mardi Gras, the 29th Annual Gay Mardi Gras Bead Toss takes place from the world famous balcony at Ambush Mansion located between Oz and Bourbon Pub Parade, and Cafe Lafitte in Exile and Clover Grill. Celebrating the 67th Gay Mardi Gras, Aubrey Synclaire will lead the 29th Annual Gay Mardi Gras Bead Toss Tuesday, Feb. 9 beginning at 2pm. It all takes place from the world famous balcony at Ambush Mansion, 828 Bourbon Street, between Oz and Bourbon Pub Parade, and Cafe Lafitte in Exile and Clover Grill. The 22nd King Cake Queen of Gay Mardi Gras is the first in history to continue her reign into a second year returning as Queen of the Opera: Act II. Co-Captains of the Krewe of Queenateenas added this interesting twist to this short Carnival season due to private family obligations which require the co-captains to remain out of town for much of the season. Only 50 guests are invited to the Bead Toss each year, 10 from the reigning queen, and 40 from the co-captains. The King Cake Queen is chosen from those revelers participating. The individual exhibiting the most enthusiasm and expertise in bead toss techniques is chosen to reign as King Cake Queen the following year. The official photographer of the King Cake Queens, Larry Graham, has produced three portraits this year reflecting the true meaning of Mardi Gras: PURPLE representing Justice, GREEN Faith, and GOLD Power. Second Official Portrait by Larry Graham of her imperial majesty King Cake Queen XXII of Gay Mardi Gras Aubrey Synclaire, Queen of the Opera: Act II in GREEN representing Faith in the colors of Carnival. 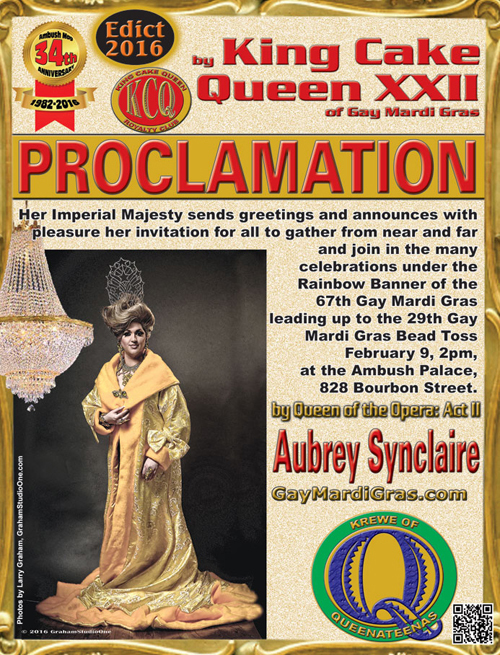 "Queen of the Opera: Act II,"
In an interesting twist to the short 2016 Carnival Season, Aubrey Synclaire will continue her reign as King Cake Queen XXII of Gay Mardi Gras. The Co-Captains of the Krewe of Queenateenas, Rip and Marsha Naquin-Delain, are proud to announce that 2016 will see "Queen of the Opera: Act II." This will be the first time a King Cake Queen has reigned for two years. The Queen of the Opera will lead the 29th Official Gay Mardi Gras Bead Toss on Fat Tuesday, February 9, 2016 from World famous Ambush Mansion's Bourbon Street balcony at 2pm. Located at 828 Bourbon Street, the Bead Toss follows the 52nd Annual Bourbon Street Awards, beginning at 12noon, hosted by Oz New Orleans and Ambush Magazine. The co-captains made their decision based on private family obligations. Visit www.GayMardiGras.com/KCQ for the latest information.